The best leaders spend more time listening rather than talking. After they listen, they provide feedback. One of the key traits of high-performance startup teams is the frequency and quality of feedback. Feedback is an essential currency in team management — it is how we optimize performance, keep people engaged and ensure that the entire team is aligned. Every time a member of our team communicates the status of a project or an issue they may be having, it is our job as leaders to provide one of the types of feedback above. Feedback isn’t just about the classic “constructive criticism” — instead, feedback is written confirmation that we are aligned and should proceed in a certain direction. This is the essence of why feedback is so important: failure to deliver it means we could be marching in different directions, ultimately carrying out the wrong strategy. Every time you have an email or a meeting, think quickly about feedback. What feedback does this interaction require? If it is someone sending the draft of a press release, or mock up of a design, at a minimum they need confirmation feedback that the draft is aligned with our strategy. Feedback is only valuable if it is accurate and honest. If someone is not working on the right priorities or executing poorly, you are helping them by delivering that feedback so they can adjust their strategy and do better. It’s critical that your feedback is specific: what about the deliverable is being executed poorly and how can it be better? Consider how your feedback will be received and strive for a culture that values bluntness and honesty. This is the marking of a high-performance organization. Certain types of feedback, like broad performance feedback on how each member of our team is doing, should be scheduled in a rhythm such as monthly 1-1 meetings. It’s unfathomable that a team member should have to wait for an annual review to understand how they are performing. If you give continuous feedback at the completion of each project (and throughout), your team will have more opportunities to optimize and do a better job. Feedback must be documented. I follow the rule “if it’s not in writing, it didn’t happen.” When Joe on our marketing team sends me a preview of our weekly campaign email, and it looks good, I often reply “Approved — and well done!” I want Joe to be able to have a written record that I reviewed and confirmed so there is zero doubt that the campaign email is ready to be used. 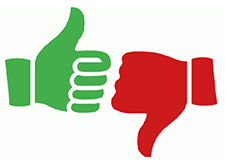 If we deliver negative feedback, there should always be a call to action. In other words, if a project is not where it needs to be, we must say “This is not where it needs to be” AND “Let’s meet in 30 minutes to review it” or “Try adjusting the first paragraph to be more focused on X.” If feedback is not actionable, the person receiving it cannot use it to become better. Feedback is all about communicating a message that is likely very important to the receiver. They make take certain actions depending on it. For example, if you give them feedback that their writing style is not effective for the task at hand, they may research new styles and practice to get better. Therefore, it is imperative that we use clear, precise language when delivering feedback. Nothing convoluted and no big words. Keep it simple. What happens if we fail at giving feedback? The worst scenario is inaction — when we give no feedback at all. This leaves people in the dark, confused over how to proceed. Every team member deserves to understand how they are performing as a contributor. They also deserve to understand how their deliverables are aligning to our strategy and goals, and the only way to show them that is through feedback. So, startup managers: give feedback. Give lots of feedback. Follow these guidelines for strong team performance with energy and focus.